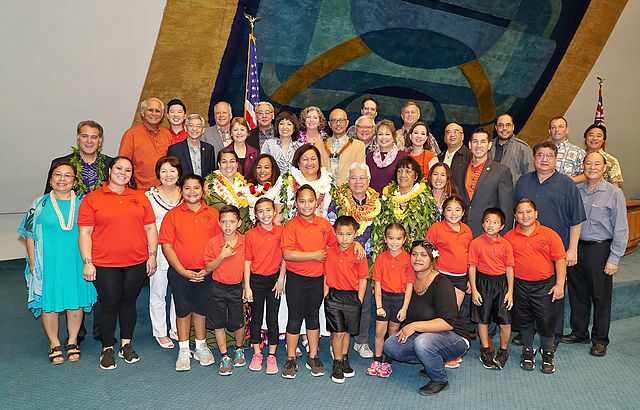 The Hawai‘i Senate Majority announces that the Hawai‘i State Senate honored five Hawaiian language kumu for their leadership in reviving and teaching ‘ōlelo Hawai‘i in our schools statewide. 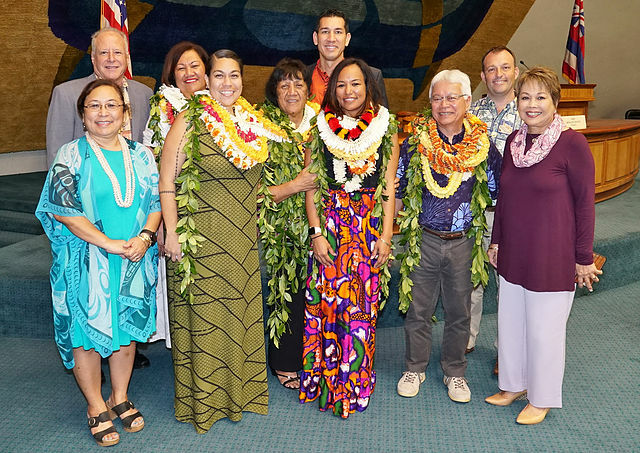 These ‘ōlelo Hawai‘i kumu are Dr. Larry Lindsey Kimura, Dr. Ku‘uipolani “Ipo” Kanahele Wong, Dr. Papaikanī‘au Kai‘anui, Kananinohea Kawai‘ae‘a Māka‘imoku and Lolena Nicholas. Courtesy of Hawai‘i Senate Majority office. Dr. Larry Lindsey Kimura is a pioneer of the ‘ōlelo Hawai‘i movement and he has worked tirelessly for its revitalization for almost 50 years. Dr. Kimura is an Associate Professor of Hawaiian language and Hawaiian Studies at Ka Haka ‘Ula O Ke‘elikōlani College at UH Hilo. 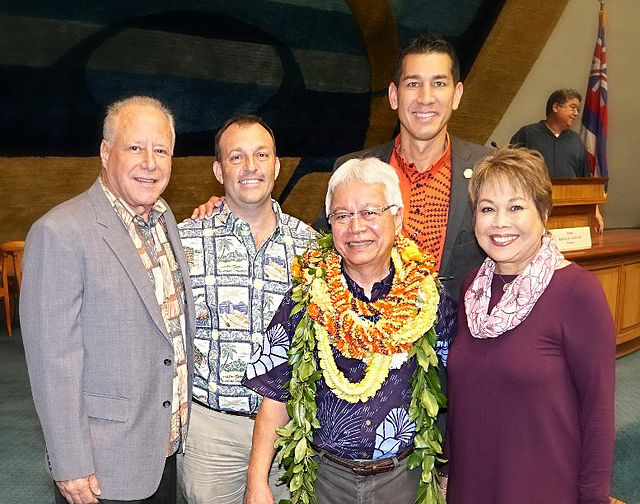 Dr. Kimura founded the Ka Leo Hawai‘i Hawaiian language radio talk show in the 1970s and 80s, during which time he also co-founded ‘Aha Pūnana Leo and wrote curriculum for Papahana Kaiapuni Hawai‘i (the Hawaiian Immersion Program) in the public schools. Here he developed the course material and trained teachers to teach their subjects in Hawaiian language statewide. Dr. Kimura is also a well-known songwriter and ‘ōlelo Hawai‘i activist. Dr. Ku‘uipolani “Ipo” Kanahele Wong is born and raised on Ni‘ihau and she was the mānaleo (native Hawaiian language speaker) resource kumu at the Kawaihuelani Center for Hawaiian Language at UH Mānoa. She is the first person from Ni‘ihau to receive her doctorate degree in education and she currently serves as an Associate Professor at UH Mānoa and as the Director of Kawaihuelani Center for Hawaiian Language. Lolena Nicholas is also a native speaker from Ni‘ihau. She was a co-host for the radio talk show Ka Leo Hawai‘i, and she has also served as the mānaleo at Kawaihuelani Center for Hawaiian Language. Known fondly as “Auty Lolena” to thousands of ‘ōlelo Hawai‘i students statewide, Kumu Nicholas is an icon in the Hawaiian language revitalization movement. A film was produced in 2014 about her life’s work. Dr. Papaikanī‘au Kai‘anui graduated with the first Hawaiian immersion class on Maui in 2001, and she is the first immersion student to complete a doctoral degree. Today she is an instructor of Hawaiian at Maui College. Kananinohea Kawai‘ae‘a Māka‘imoku is the first immersion graduate to return as a Hawaiian immersion teacher and she is now helping to prepare new immersion teachers across the state. She also sits on the faculty of Ka Haka ‘Ula O Ke‘elikōlani College of Hawaiian Language.